If the saw is used, the tip of the blade is worn out. And, it becomes dull. The accuracy of setting worsens, too. It doesn't cut, and then, the saw embeds itself in a tree and movement worsens straight. The set of the saw is a thing that sharpens the blade with file, gives a blade a keen edge, corrects setting, and cuts well again. This photograph is special file used for the set of the saw. Recently, the person who does the set of the saw is a little or, there is a shop that doesn't put this file either. Such file is used to set saw. Cutting worsens to the saw when the part where the blade is pointed out rounds. Cutting improves when the part in the point is sharpened with file. The way planes the blade in the same direction pushing. Next, the saw is turned inside out, and the other blade is planed with file. The sharpened blade seems for the tip of the blade to shine. When sharpening it, I think it is good in the extent lightly patted without making efforts so much. If the saw is used, the saw might embed itself in a tree even if the set is done and movement become bad. In this case, it is necessary to correct the part that is called the setting of the saw. 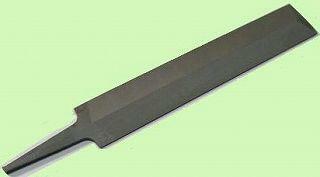 This photograph is seeing of the saw from the direction of the tip of the blade. 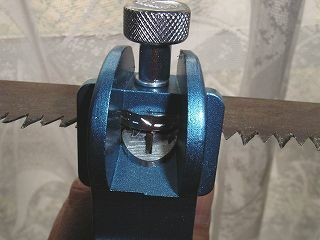 It is said to the saw the setting, and wood is cut a little more widely than the width of the saw, and the blade of the saw is curved to the outside alternately as the saw moves smoothly as shown in this photograph. If the saw is used, this setting part is worn out. I used this setting (saw set of "SOMAX") though other various tools seemed to be in the method of the setting putting of the saw. This photograph is a setting of the saw (No.250 for saw set details of "SOMAX"). The setting can be put up well by using this. This can use 4-12 mountains and the thickness for every 25mm of the number of teeth of woodwork saws for 1.6mm or less. How to use of the setting of the saw. Please do not stick to threads per inch so much, consider hardness and the structure etc. of the blade of the saw based on the experience, and decide a suitable number to the selection of the number. Please note that the blade doesn't break for an especially hard blade. Setting can be put up only by applying to the blade of the saw accurately and gripping the lever when the adjustment ends. Next, the saw blade is reversely turned and it does again. There were some old saws in my house. It came to cut very well when I did setting of the blade of the saw. It is possible to use it many times by reviving an old saw by this.